The Parable of the Prodigal Son (Luke 15:11-32) really resonates with most people, I think, because we've all been the one who wandered away and got into trouble at some point in our lives. It's an easy story to understand, too. Son takes his inheritance money, leaves home, spends all the money stupidly, realizes how stupid he has been and comes home feeling unworthy to be called a son. Father forgives him completely and celebrates his return. Since it's a parable, we then have to look at the meaning, which is also easy to understand. We are the stupid, wandering child and God is the forgiving Father who welcomes us back home and celebrates our return. It's the perfect Father's Day story! There's an element of Jesus' story that we can miss, though, because of the cultural differences between our day and His day. By verse 20 of the parable, the son is returning home to ask for work as a servant since he is no longer worthy to be called a son, "But while he was still a long way off, his father saw him and was filled with compassion for him; he ran to his son, threw his arms around him and kissed him." It seems perfectly natural, doesn't it? The story is set in an era long before cell phones and text messages. Whenever we leave family to head home (a drive of several hours no matter who we've been visiting), we're always reminded to text as soon as we get home so they'll know we made it safely. Back then, though, communication would have been pretty much non-existent, especially considering the son left home and "squandered his wealth in wild living" (v 13) in a distant country. The father hasn't heard anything about his son's well-being since he left home. We don't know how long that has been, but the son had time to spend all his money, then to hire himself out to work, and then finally to return home again. The father has been waiting for news for a while and he's anxious about his son, wondering if he's okay. You know how you can recognize some people by the way they walk, or the way they carry themselves? Well, this dad saw his son when he was still a long way off and he recognized him right away, despite the ragged clothes. Probably excited and relieved, the father runs to his son. This is where the cultural difference trips us up. Grown men didn't run in Jesus' day. It was considered beneath their dignity. This father, by running to embrace his wayward son, was embarrassing himself completely in front of anyone who saw him. But at that moment, the father didn't care about his dignity, or who was watching, or what they would think. His son was home! Of course, it's only a parable, so this never actually happened as Jesus tells it. But as I said earlier, there's a spiritual meaning here. And if the father in the story represents God, our heavenly Father, then what does the running mean? I think it is all about the father's emotion. Can't you just feel his joy as he runs to his son? The parable of the prodigal son is one of three stories Jesus told about people who lost something valuable (a sheep and a coin were the other lost things), and in all three stories the emphasis is on the joy when the lost thing is found. The father in the story doesn't simply wait for the son to come to him, nor does he calmly shake his hand, both of which would have been more in keeping with societal norms. He doesn't even wait to find out what his son has been doing all the time he's been away, or why he looks so ragged. No, the father is so overcome with emotion that he runs to greet his son, throwing all thoughts of everyone's expectations aside, and welcoming him with complete acceptance. 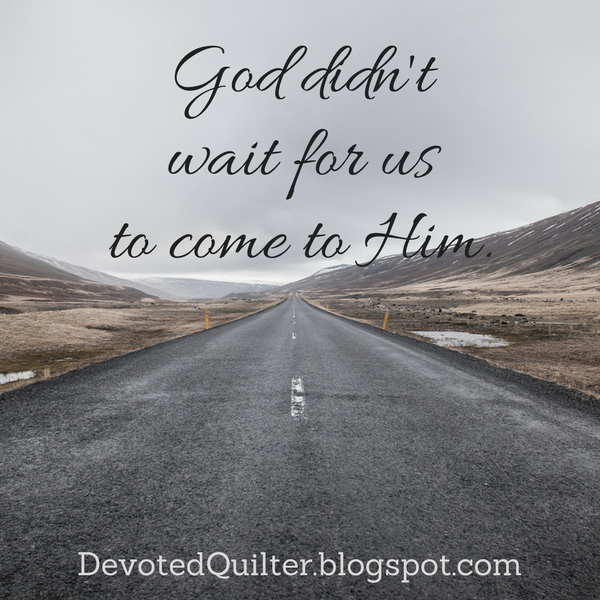 God didn't wait for us to come to Him, either. He sent Jesus to be our Savior because He knew there was no other way to restore our relationship with Him. Now, whenever a person accepts Jesus, our Father welcomes him or her with the same complete acceptance, the same celebration, the same boundless joy. Isn't it wonderful to know that our Father feels such joy over us?